Grace Lee Boggs was a long-time activist, thinker, and revolutionary. She made an essential contribution to a history that defines our time today. Grace participated in the first March on Washington and was actively involved in Black Power and revolutionary union movements. Her commitment to dignity for all led her to organize many of the marches and protests in the 50s and 60s for civil rights, jobs, and better education. With her husband and comrade Jimmy Boggs, she would spend most of her life in Detroit: supporting and leading the struggles throughout the city’s industrial boom and post-industrial devastation. Grace Lee Boggs was a Marxist, but she refused to let her Marxism remain rooted in books and abstraction. Her thinking and practice developed out of concrete engagement with and participation in the black liberation struggle, and she deeply understood that her philosophy and actions came from listening to and learning from the people of this struggle. It is thus important that we identify her with the black radical tradition. This tradition has fought for and continues to fight for black liberation, working towards dignity and liberation for all of humanity. Grace emphasized the power and necessity of ideas and of ideology. She criticized the notion that ideas come from and belong to the elite. Instead of searching for abstract truth (or lack of truth) in ivory towers, she would “keep her ears close to the ground” and remain close to the life-world of ordinary people. More than any other group, her immediate community, the black working people of Detroit, critically shaped her ideas and organizing. In the ‘60’s, Detroit was still the epicenter of a booming auto-industry, with hundreds of thousands of people migrating to the “Motor Metropolis” in search of jobs. It was and continues to be an extremely segregated society with a white police force routinely committing violence and a white justice system offering no justice to black people. Grace was organizing among the workers who would rebel against continued injustices in Detroit in the 1967 uprising. She was also among the League of Revolutionary Black Workers, who were leading the fight against the management and existing union in auto plants, both of which neglected black workers. Detroit’s history was essential to Grace and essential to understanding her life, ideas, and legacy. She reminded us that organizing in a workplace, a community, and a neighbourhood comes with many more challenges and thus, many more possibilities for change. Grace emphasized that organizing purely on a basis of a certain “identity” as reacting to real, perceived injustices would not lead to transformation. Instead, she pushed herself and the community around her to develop and work towards a vision that would allow all oppressed people to recover their humanity. Grace warned against accepting ideas without challenge, looking for easy solutions, and looking towards militancy that encourages action without ideas. For Grace, revolution is a process that requires patience– our practice must be guided by a profound critique of white supremacy, of capitalism, and of western civilization, rather than a shallow reaction to them. Grace and Jimmy called for us to stop seeing ourselves simply as ‘victims’ of systems. After all, those who have been stripped of humanity and dignity the most by systems of oppression are the ones who can least afford to remain stuck in victimization. They saw our fundamental ability to take responsibility for changing the world and encouraged us to redefine ourselves as agents who can create a more just society together. Later in her life, Grace began to emphasize the work of Martin Luther King Jr., reiterating the need to come from a place of love and dedication for building community. She would identify with the struggle against materialism, racism and militarism, values that remain normalized and encouraged to this day. White supremacy in the United States is connected to imperialist wars abroad. We must continue to struggle against these normalized values– as Martin Luther King Jr. said: "War is the enemy of the poor". We believe that understanding and engaging with the life and thought of Grace Lee Boggs is immensely relevant in understanding our current society. We are in the midst of a political and economic crisis when people are calling existing political institutions into question. As Grace said, we must see every crisis also as an opportunity, and work to build a more humane future. ​We are students who originally came together because we were Asian Americans interested in activism. We are currently immersed in a deep study of Grace, trying to absorb her wisdom, learn from her own political transformation, and let her philosophy and organizing inform our own. As we read and discuss Grace’s writings every week, we have also been in a process of reflection, both of ourselves and of our group. For the past few years, we had been fighting for more institutional support for ethnic studies, mainly funding and faculty hiring search approvals to fill empty faculty lines. Looking back, we now realize that our organizing came from a reactive place of arguing with administration and looking for acceptance within the university; we always felt tired and upset because we were reacting to the University’s failures with bitterness, rather than looking elsewhere to build the education and community that we were searching for all along. The university’s failures are an opportunity for us to educate ourselves in ways that the university is incapable of providing. We have decided to commit our organizing towards building ourselves in relation to the off-campus community. We have also decided to learn from the works of people such as Grace Lee Boggs. Grace consistently talks about the importance of building a movement from love, patience, and community. She also emphasizes development of ideas and ideology in informing action, which is a big part of our continued transformation. 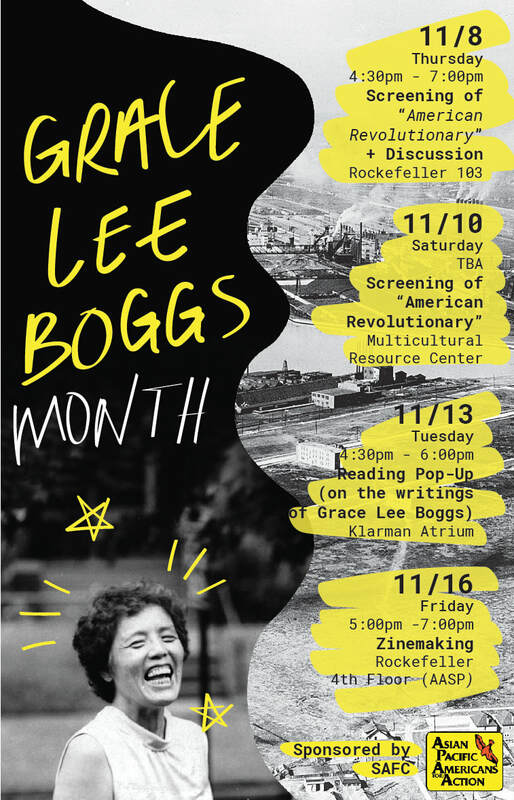 We want to develop and share these ideas by celebrating the month of November as Grace Lee Boggs month.